Each afternoon, from 1st til 11th of December, Summit of Creative Parties of ArtCOP21 offers a Face to Face with artists. Kathy Jetnil-Kijiner is a Marshallese poet, writer, performance artist and journalist. Her poetry mainly focuses on raising awareness surrounding the issues and threats faced by the people of the Islands. 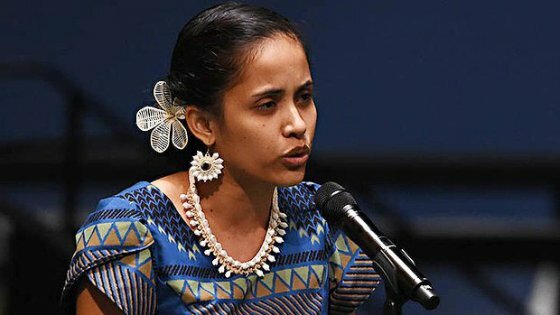 Nuclear testing conducted those islands, the rising sea level as a result of climate change: these are just a few themes her poetry touches upon. Along with writing, a lot of her poetry is performance based. She has competed in slam poetry competitions and performed at showcases, conferences, and various literature readings. She has also hosted open mics and written and performed my own solo piece.